We recently launched the Alexa Lighting API extending Alexa’s built-in lighting skill so she can securely control cloud-connected lighting and switch devices. This new API enables you to write code that translates between Alexa’s built-in lighting skill and your lighting device’s proprietary control systems. Once a customer turns on the functionality, they can control these new devices simply by saying phrases like, “Alexa, turn on the living room lights” or "Alexa, turn off the fan." The Alexa Lighting API can be used to control any cloud-connected device that can be turned on/off or have its brightness adjusted. Discoverability is easy! Devices that you enable automatically show up in the Alexa companion app in the Connected Home settings screen. 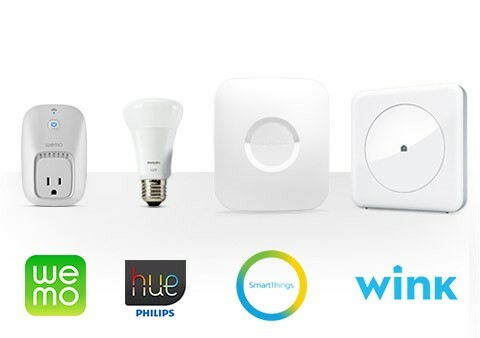 Wink and Samsung SmartThings have already built this functionality for their home automation hubs using the Alexa Lighting API, and any new devices you integrate will show up right alongside those! In order to get things started a customer will need to connect their desired device to your skill adapter in the Alexa companion app. This process is handled via standard OAuth providers, like Login with Amazon, to make the experience as simple as possible. 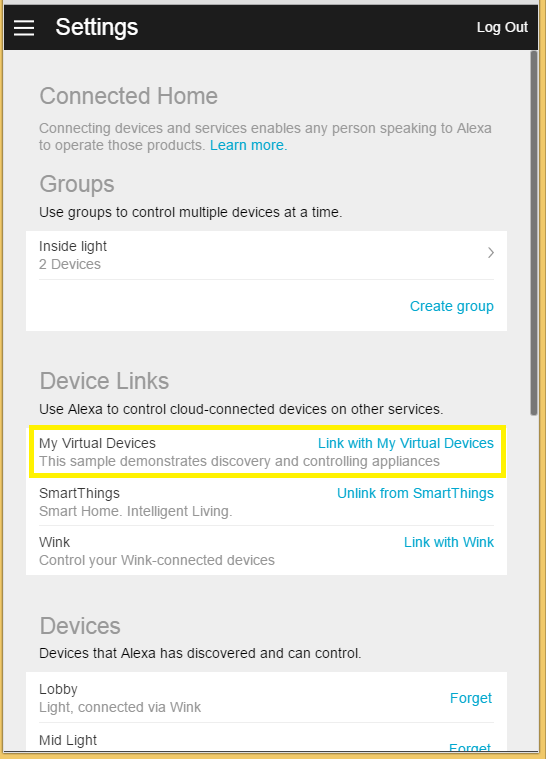 Once you have followed the steps to submit a new skill adapter and have provisioned it for testing, a customer will see your skill adapter in their Alexa Companion App’s Connected Home settings screen. In the above screenshot the linking workflow is initiated when a customer clicks on Link with My Virtual Devices. The customer is then redirected to the OAuth provider’s web portal to sign in. 3. The standard OAuth workflow will then take place between the OAuth provider and Alexa services. 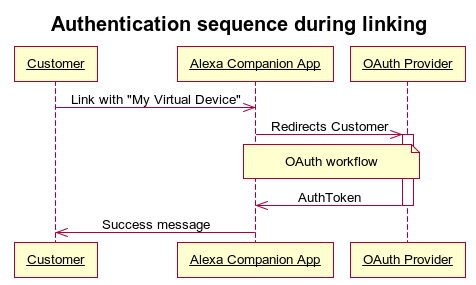 Set Login with Amazon as the OAuth provider for the Alexa Connected Home skill. To create a new security profile on Login with Amazon, go the Developer Console and navigate to Login with Amazon by clicking on Apps & Services. 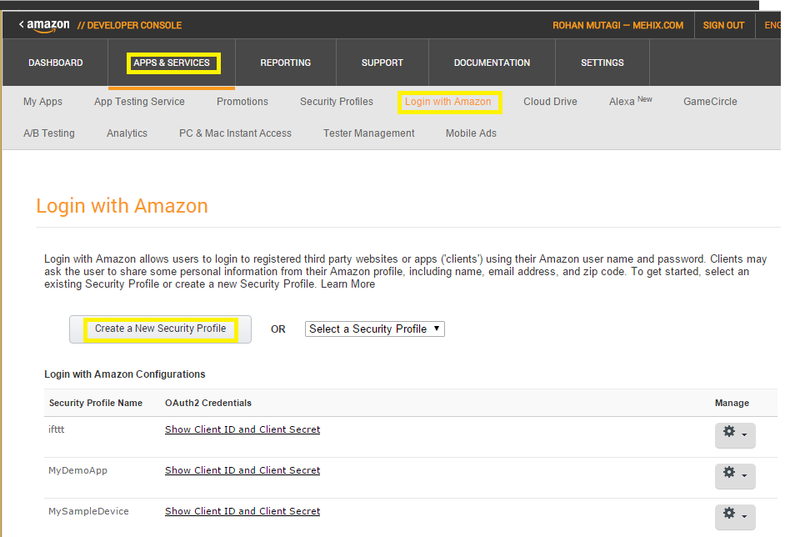 Once you are on the Login with Amazon developer console page, click the Create a New Security Profile button. Fill in the required information and hit Save. 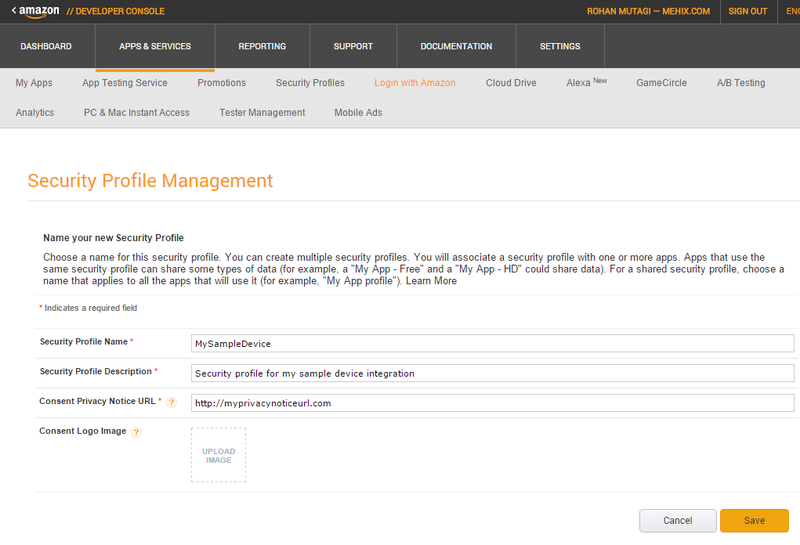 Your newly created security profile will now be available in the list of Login with Amazon Configurations. You will receive the Client ID and Client Secret. Please include this information when you submit your skill adapter for test provisioning. Congratulations, you have now configured Login with Amazon as an OAuth provider that will allow customers to easily login and authenticate to your skill. Finally, you will need to write a cloud end point (using AWS Lambda or similar service) that will handle commands coming from Alexa CoHo, and route them to your own back-end services or device. Be sure to check out the Alexa CoHo showcase for sample skill adapter code that can get you started. Once you have completed the cloud endpoint you are ready to submit your skill adapter. Gather all of the required information outlined in the Getting Started section of the Alexa Lightning API Documentation and email the Alexa CoHo submissions team. We look forward to seeing what you build!